The Accelero Xtreme III offers superior cooling performance in silence for the fastest single GPU and a wide-range of graphic cards. With its superior performance, this cooler definitely satisfies all overclockers and enthusiasts who enjoy powerful graphic cards. Featuring three 92mm PWM fans with a maximum cooling capacity up to 300 Watts, the Accelero Xtreme III manages to transfer heat efficiently away from the GPU. Besides the 84-fin heatsink with 5 copper heatpipes, the pre-applied MX-4 thermal compound accelerates the heat dissipation process to ensure the VGA board is running under optimal temperature. The Accelero Xtreme III comes with 31 RAM and VR heatsinks to cool your RAM and VR. This included thermal adhesive lowers RAM and VR temperature significantly and assures proper bond. 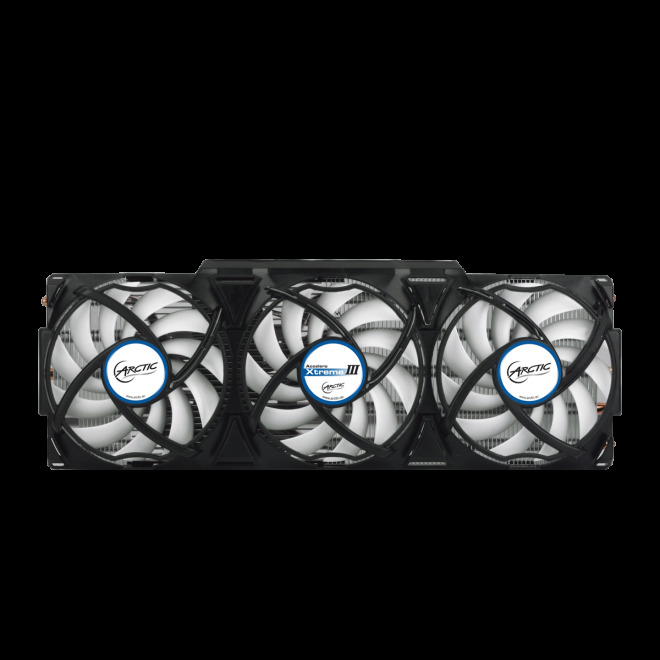 With three PWM-controlled 92 mm fans, the Accelero Xtreme III cools efficiently and silently. Thanks to the PWM control, the fan spins according to the temperature of the GPU. This means that the fans just spin up if necessary and will rest at minimum speed otherwise. PWM settings can be modified to fix the priorities between performance and noise. Click here to see how PWM settings work. Aside from it being CrossFire and SLI compatible, the Accelero Xtreme III comes with a versatile and interchangeable mounting mechanism along with 31 RAM and VR heatsinks to fit different models. New accessory sets will be available to make the VGA cooler compatible with future models.